11. 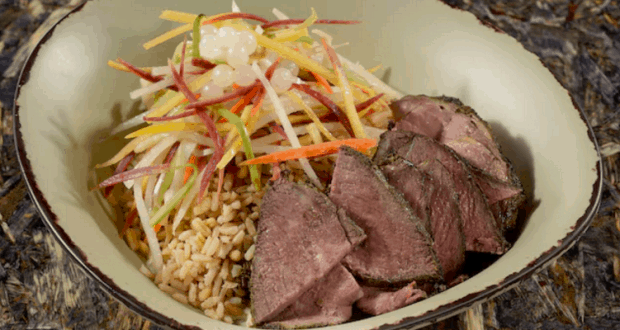 Slow-Roasted Sliced Grilled Beef Bowl – Satu’li Canteen – The newest area of Disney’s Animal Kingdom is the immensely popular Pandora – World of Avatar which invites guests to explore the otherworldly Valley of Mo’ara. There are majestic floating mountains, flowing waterfalls, and signs of the Na’vi people as well as indications of humans who now run a quick service dining location operated by the Alpha Centurai Expeditions company. Satu’li Canteen is open daily for lunch and dinner and serves up a unique and truly interesting menu that combines options that are right at home in the alien Pandora with classic flavor profiles. One of the most interesting menu choices at Satu’li Canteen is the Slow-Roasted Sliced Grilled Beef Bowl which features meat marinated in a blend of garlic, herbs, red pepper spice, and red wine vinegar that is served with crunchy vegetable slaw, and boba balls. Guests can also choose their own base and sauce making it a versatile option that guests are sure to love.